Each week, The Dissolve designates a Movie Of The Week for staffers and readers to watch and discuss together. Feel free to pitch in or suggest your own discussion points. It’s harder to pinpoint exactly what influenced Brazil, since it’s so Gilliam-esque, but the faltering technology resembles one of those old “house of the future” Looney Tunes cartoons, and Robert De Niro’s mustachioed terrorist handyman Harry Tuttle is a classic trickster guru, like Robert Crumb’s Mr. Natural (with Jonathan Pryce’s Sam as Flakey Foont). At times, the exaggerated figures, social satire, and clockwork slapstick are so much like the cartoons of Tex Avery and Frank Tashlin that it would only take a few bars of Raymond Scott’s “Powerhouse” to complete the reference. But mostly, Brazil’s style seems to have spilled right out of Gilliam’s subconscious, without much thought as to where something like the movie’s heaving air-duct “lungs” or the doctor wearing a baby mask came from, or what it might mean. First and foremost, they’re amazing doodles. Tasha: In the book version of The Battle Of Brazil, author Jack Mathews (the L.A. Times film critic who chronicled the studio battles over the film, and also scripted the documentary derived from his book), says the reason for those creepy baby-doll masks on Michael Palin and the Jim Henson-esque “forces of darkness” monsters in the labyrinth was that Gilliam’s mother sent him a similar mask, and he found it memorably horrifying. And that he specifically wanted the baby-masked creatures with decaying bodies to be an unsettling crossover between youth and age, infancy and decrepitude. Reading the book and interviews with Gilliam can be startling, because it’s apparent that a great deal of thought went into these seemingly chaotic, random images—much more than I would have suspected. 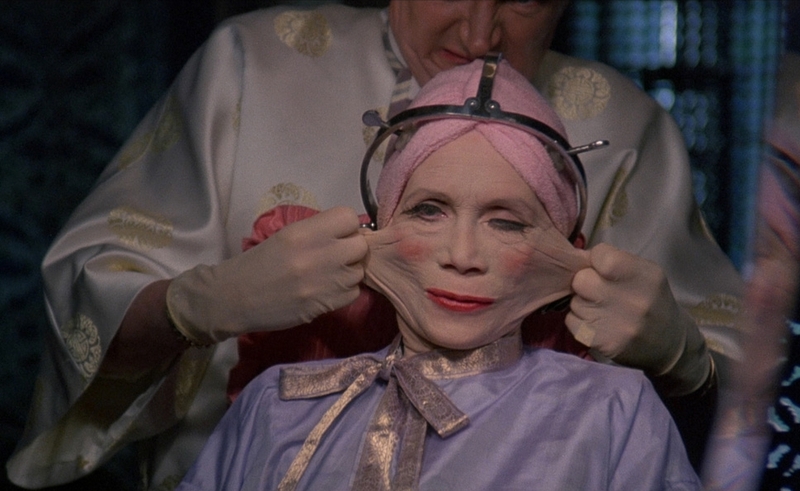 I always thought of Gilliam as an undisciplined, self-indulgent director who throws every idea he has up on the screen, but it took this re-watch of Brazil to make it clear to me how much the pieces fit together, and how many of his seemingly throwaway gags or images play into carefully developed themes. Mike: What’s fascinating to me about Gilliam’s style—in Brazil more than in any of his other movies—is that it’s both disciplined and undisciplined, seemingly depending on his mood. The opening scenes are a model of visual economy, using Deputy Minister Helpmann’s appearance on a TV news program both as an expository device (filling us in on the war against terrorism in this future world) and as an elegant way to unite several locations in a single moment of time. 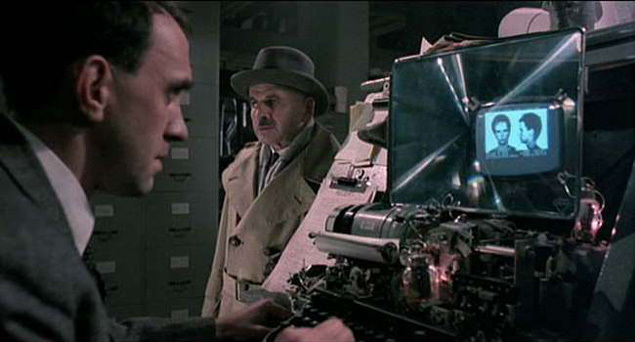 Some of that is screenwriting, but the way Gilliam uses various TV screens to seamlessly transition from the rubble of a bombed department store to the Ministry of Information, and then to the apartment building where Jill and the Buttles live, while simultaneously parceling out plot details (namely the glitch that changes Tuttle to Buttle), could scarcely be more concise. But in the very next breath, Gilliam introduces Kurtzmann’s office via a manically choreographed stream of frantic functionaries, as the camera hurtles down a narrow corridor at top speed. (My favorite detail of this shot—which is actually two shots, as Gilliam couldn’t afford to build both sides of the office; he just creates a Rope-style blackout and turns the camera around during the cut, heading back down the same corridor he just left—is the dude pushing the ladder at the very end, who you can actually see rushing to get out of the camera’s way at the last instant, lest it mow him down.) It’s a thrilling bit, one of the film’s signature moments, but it isn’t strictly “necessary”—Gilliam could have conveyed the Ministry’s bureaucracy-gone-mad tumult in a simple master shot. But that isn’t… well, his style. He’s concise and elegant when he needs to be, but otherwise is perfectly happy to showboat. And the movie is all the richer for it. Matt: My favorite visual motif is Gilliam’s repeated use of high-angle and bird’s-eye shots looking down—sometimes directly down—at the characters. It really hits home the idea that Sam is an insignificant, helpless speck in this vast bureaucratic morass. Like the beetle that falls into the computer, he creates chaos, but gets squashed in the process. Nathan: Gilliam’s camera glides about manically throughout Brazil, but every once in a while, the camera stops moving for a long take. These moments are more effective for being parceled out sparingly and deliberately. The most poignant one: When Sam gingerly, unconvincingly tries to explain to Buttle’s widow that a bureaucratic snafu cost her her husband, the camera stays on her face in the foreground as she reacts to Sam’s fumbling efforts with a look of unrestrained despair and heartbreak. It’s a scene of pure, visceral emotion that bares the emotional wreckage wreaked by the state, simply by not blinking or turning away as a devastated woman feels the full effect of a crippling, irrevocable loss. Scott: Shameful confession: I tend to greet Terry Gilliam movies with a small measure of dread, even the good ones, because I know I’ll be asked to sort out an abundance of visual information, photographed through the zooming cameras and wide-angle (or fisheye) lenses used to emphasize whatever grotesque dystopia he’s exploring this time around. Noel refers to it as an experience akin to “flipping through a cartoonist’s sketchbook”; I often find it more like forking through a particularly thick slice of meatloaf. 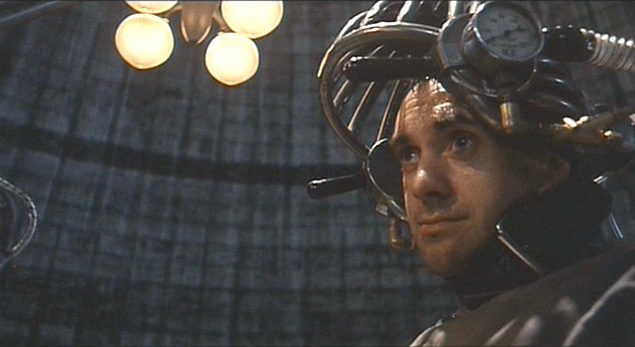 Brazil is unmistakably a Gilliam production, with layers upon layers of detail that can’t possibly be sorted out on first (or second, or third) viewing, but this time around, I was surprised by how cleanly Gilliam lays out this very complex universe of glowering bureaucrats presiding over retro-futuristic chaos and despair. The key here is that he sticks closely to Jonathan Pryce’s Sam Lowry, and allows the audience to get whisked through the film right along with him, rather than cobbling the world together piecemeal. Tasha: That said, the frames are packed with incidental gags—particularly the grim Soviet-era posters with slogans like “Suspicion Breeds Confidence.” Fun fact: Gilliam has said he thinks his tendency to overstuff frames with side jokes comes from a childhood of reading Mad magazine, with its margins packed with energetic, clever Sergio Aragonés comics. That influence explains a lot about his sense of humor, too. Tasha: One of Brazil’s most fundamental themes is how bureaucracy chokes the humanity out of people, encouraging learned helplessness at best, and callous indifference at worst. If a piece of paper says someone has to be tortured and murdered, well, whoever issued the paper must know what they’re doing, right? As long as there’s a receipt for the murder victim, it’s all clearly okay. The theme starts with the Tuttle/Buttle bureaucratic error that kills an innocent man and destroys his house and family, but it repeats over and over. In Sam’s final dream sequence, even the heroic Tuttle is literally buried by paperwork, until there’s nothing left of him. It’s also significant that Tuttle is an outlaw simply because he operates outside the bureaucracy: In a society where nothing can be done without an insane level of paperwork, even repairing an air conditioner is seditious. Similarly, fighting the bureaucracy by trying to point out the Tuttle/Buttle error and rescue Buttle gets Jill stamped as a terrorist, and ultimately killed. The film’s single most tragic plot thread is that Sam is actually terrific at navigating the bureaucracy, and as a result, he’s content within a system that makes most people miserable—until he starts to fight it, at which point it claims everything he cares about, then drives him insane. At the beginning of the film, he enjoys his efficiency and his indispensability. In the notoriously defanged, commercial “Love Conquers All” cut of the film, prepped for theaters and eventually used for TV, Sam is softened by edits that make him unaware Buttle is dead; he’s a benign cog in a malicious machine. But in Gilliam’s cut, he’s clearly aware of how the system has failed and destroyed a man, and he’s complicit anyway, trying to treat Buttle’s widow with the studied indifference and reliance on paperwork that characterizes his world. He’s a little too soft-hearted to make a good bureaucrat, but until Jill gives him that horrible, poisonous hope, he’s trying hard to reach a coveted indifference. Scott: What strikes me about the bureaucracy that governs the world of Brazil, beyond the absurdities that drive its tragicomic story forward, is how there doesn’t seem to be any ideological force that accounts for it, or keeps it in place. At this point, even after 13 years of terrorist resistance, the system has become its own organism, like a parasite taking over the host. We all deal with bureaucracies of some kind, and the film makes the keen observation that we conform to them with little thought because that’s just the way things are. And people who do want to put up a fight first have to identify what exactly to fight against, because the source is nebulous, replaced by a confusing latticework of forms and gatekeepers. Better to sign the paper in front of you—or in our case, accept the terms and conditions without looking at the fine print. Nathan: In Brazil, bureaucracy’s never-ending demands serve a couple of distinct purposes, by breaking the human spirit and enforcing conformity. They replace the life-affirming, soul-stirring escape of Sam’s fantasy world with a dispiriting universe of papers and instructions. The bureaucracy is like the Rube Goldberg contraptions found in Sam’s apartment: They utterly fail to achieve the aims they’re meant to address. Mike: One of Brazil’s best and most pointed gags about the nature of bureaucracy in this world is the recurring “gift for executives,” which turns out to be a binary device with a weight you wind up and let fall toward a divide, where it lands at random on YES or NO. The strong implication is that many of the decisions being made by those in power, including choices that may dramatically impact ordinary people, are completely arbitrary. I’m also fond of the exchange Sam has with the night-desk guard at the Ministry of Information, in which Sam is nonplussed that he isn’t being asked for identification of any sort before being permitted entry. Such a bureaucratic world would normally demand multiple proofs of identity, but some things, it seems, are well taken care of, which is vaguely disturbing. “I could be anybody,” Sam protests. “No, you couldn’t, sir,” the guard serenely replies. Noel: Tasha, I’m glad you noted Sam’s skills, which is an aspect of the character I’d forgotten until this go-round. I had a memory of Sam as perpetually put-upon and miserable, thinking in particular of the famous scene of him sharing a desk through a wall with a co-worker who keeps yanking it away. But Sam is actually a take-charge guy at times, capable of delight and joy, and in the end, he handles that desk situation, giving as much as he gets with that co-worker, and even pushing the guy around a little himself to gain access to his computer. Matt: Ah, those computers; the perfect symbol of the bureaucracy’s absurd inefficiency. Don’t make the monitors bigger; keep the monitors the same tiny size, and hook a giant magnifying glass to the front. That’s an elegant solution! That one worthless piece of equipment says everything you need to know about this organization’s competence. Tasha: The desk gag, too. I can’t imagine a better illustration of a dysfunctional organization with limited resources. Or a better way of getting across how this bureaucracy forces people to waste their time and focus on petty squabbles, resentment, and the fear that other people might be getting slightly better treatment, or just a little bit more of the pie. Nathan: A working title for Brazil, tongue-in-cheek or not, was 1984 1/2, a title that winkingly acknowledges the film’s tremendous debt to George Orwell’s dystopian novel 1984 and Federico Fellini’s postmodern cinematic fantasy 8 1/2. Orwell famously constructed a nightmarish future out of the grubby scraps of the present and past, a hellish tomorrow out of the ugliest elements of yesterday and today. Gilliam does him one better by constructing a hellish future almost entirely out of elements of the distant past. For Sam Lowry, much of the escape that makes life bearable comes from the pop culture of the past: the dreamy theme song that recalls both an earlier era and a more carefree world, and the movie posters that line his apartment walls. Brazil is giddy with cinematic references: the endless hallways that hearken back to The Apartment’s vast workplaces; the towering, gothic sets out of German Expressionism; entire late-film sequences that wouldn’t feel out of place in a silent film. Brazil is infused with elements of old-school glamour grown monstrous and decayed, like a swank nightclub whose veneer of continental sophistication is fatally compromised by the ugly ducts snaking through its interior, as well as regular terrorist attacks. Brazil feels informed by every film Gilliam ever loved, yet it nevertheless represents a wholly new, perfectly realized vision. Tasha: Gilliam has said he visually designed Brazil so it wouldn’t be associated with any particular era: He wanted the design to feel like the entire 20th century was collapsing in on itself, into one homogenous period. The two most striking aspects of that for me are the junky technology, which is a mishmash of eras—the personal computers have hefty old manual typewriters as keyboards, the home phones have giant plug-driven switchboards—and the costuming. Sam’s mother wears actual designs from the 1930s, including the wacky “shoe hat.” Jill’s clothing and hairstyle are 1980s industrial. Sam dresses in the natty suits of a gentleman detective in a 1940s noir. I’m very curious what someone more versed in men’s fashion would say about the simple grey suit he wears through half the film, vs. the one Jack gives him as an upgrade. Is he changing eras at that point? Noel: And yet with all of that clunky retro tech, the world of Brazil finds a place for funky art-deco glass-walled subway cars, which don’t appear to belong to any particular era, but which almost make this rusty future seem like it could be tolerable. 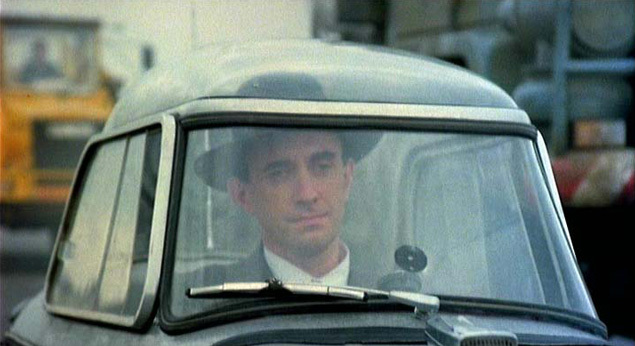 Mike: One of the goofier past-as-future elements is the ridiculously tiny car Sam drives. I was surprised to discover, when I first found a Brazil FAQ on the Internet in the ’90s, that it’s a real car, made by Messerschmitt—a German company that otherwise almost exclusively manufactured airplanes. It developed that little bubble car (I think it’s the KR200, or Kabinenroller) in 1955 and continued selling it through 1964. Unlike some of the film’s other outmoded technology, however, the Messerschmitt really does look like a car of the future, if only because it’s so unusual. It actually reminds me a little of the PeopleMover cars that used to tool around Disneyland. That’s perfect, because pretty much everything in Tomorrowland now looks like what it is: the past’s limited notion of what the future might be. Tasha: Oh, another bit of past-as-future lore from the film: Gilliam was obsessed with the idea that prisoners in the 17th-century witch hunts were forced to pay costs for their own incarceration and torture, and even the wood used to burn them at the stake. I’d never realized how heavily that theme runs through Brazil until this viewing: Buttle gets a speech about financing at his arrest. The refund check to his widow which causes so much trouble for Sam is because Buttle’s heart condition meant he died under torture earlier than Tuttle would have, so the imprisonment he’d paid for up front wasn’t completed. When Sam is arrested at the end, he goes through a gauntlet of functionaries, including a loan officer who discusses his financing options in paying for his imprisonment. And one of the guards who straps Sam into the torture chair at the end tells him not to hold out too long, or he’ll wreck his credit rating. This was clearly a bit of historical barbarism that really stuck with Gilliam, so much that he made it the ultimate evil of his future dystopia: the way the government not only destroys lives, but forces everyone to be complicit in, and liable for, their own destruction. Scott: With regard to the retro-futuristic gadgetry in the film, I immediately thought of Jacques Tati’s Mon Oncle, about a man who lives in an ultra-modern, fully automated abode that keeps backfiring on him. This was Tati expressing a distrust of technological “advancement,” and you can see some of that in Brazil, especially in the early scene in Sam’s apartment, which is full of malfunctioning breakfast-making flim-flammery. (That limp piece of toast is particularly hilarious.) Even other dystopian visions of the future on film tend to concede that our machines will be sleek and smooth-running, often to the point where that in itself becomes a problem. But Brazil nails the problem that afflicts the worst bureaucracies: They’re stale and underfunded, and remain rooted to the past through neglect and lack of resources. Any trip to a government office will confirm that. 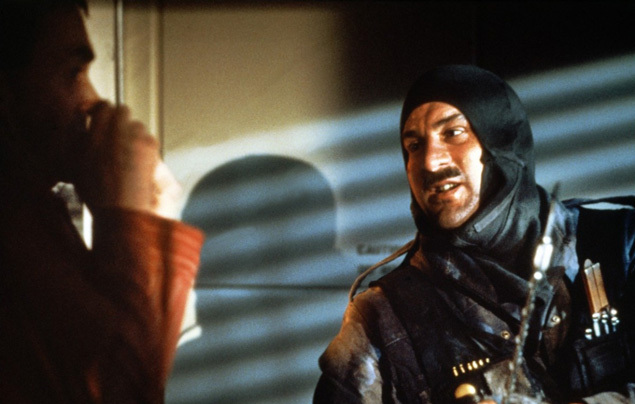 Mike: Having spent years working with Monty Python—who once wrote and performed a sketch about an undertaker recommending various ways of eating a dead relative—Gilliam developed a strong taste for gallows humor, or at the very least had his inherent taste encouraged. For all its fundamental seriousness, Brazil is chockablock with sick jokes. The most memorable (and explosive) finds Sam and Harry Tuttle taking particularly disgusting revenge on the Central Services heating engineers who’ve requisitioned Sam’s flat, but there are other, more deadpan instances as well. It’s hard not to laugh, however queasily, at the horrified Mrs. Buttle being briskly asked to “press harder this time” as she signs the forms that authorize the Ministry of Information’s abduction of her husband, for example. At the same time, Gilliam is aware of the real pain his characters suffer. There’s a blink-and-you-miss-it moment in one of Sam’s fantasies, right after a bomb goes off in a department store, in which the weapon he’s brandishing is a severed human arm. (It’s actually a mannequin’s arm, if you look closely, but it nonetheless calls to mind the human victims lying all around him.) And every now and then, Gilliam decides that something just isn’t funny. The euphoria Sam feels after he and Jill successfully evade a police vehicle, forcing it to crash, is immediately punctured by the sight of one of the officers stumbling around with his entire body consumed in flames. It’s a sober reminder, in a movie that often makes light of good people’s misery, that even the bad guys suffer. Tasha: For me, one of the grimmest jokes in the whole piece is Gilliam’s use of little children, including his own 4-year-old daughter Holly, playing the role of Jack’s daughter in a scene in his office. When Jack gives Sam a new suit, then runs off, she coyly tells Sam, “Put it on, big boy, I won’t look at your willy.” The children Sam runs into when he goes to Buttle’s complex with the check are similarly aged beyond their years: When he tries to be avuncular, one tells him to piss off, and then they run off to torch his car. All this is darkly funny, but also a horrifying indication of the ways this twisted dystopian culture is warping its next generation. But the grimmest joke comes before Sam even arrives, when the camera captures that little group of arsonist kids playing arrest-the-terrorist: One child is holding a victim at toy-gunpoint while a third child frisks him, and a fourth child stands by passively with a bag over his head, like Buttle being processed for the torture mill. Kids model what they see around them, and it’s usually kind of cute and funny to see scaled-down kid versions of adult behavior, but the humor is awfully bitter here. Nathan: My favorite unspeakably dark gag has “Hava Nagila,” the celebratory Jewish song ubiquitous at weddings, bar mitzvahs, and other happy events, playing in the background of the swank nightspot where Sam meets his mother during a terrorist attack. It’s simultaneously jarring and hilarious, surreal and wonderfully unexpected, to observe the juxtaposition of prototypically chipper, upbeat music and a tragedy so dispiritingly commonplace in the film’s dystopian world that no one seems to even pay much attention anymore. Scott: To bounce off what Nathan was saying about the use of “Hava Nagila” during a terrorist attack, the reaction to those attacks throughout the film is hilariously nonchalant. Terrorism has become such a part of everyday life that the women at a ladies’ lunch—content with their puke-green processed entrées—don’t so much as flinch when a bomb rips through the wall behind them, leaving debris and bodies writhing on the floor. The pointed humor is twofold here: There’s the obvious joke about terrorism being so ingrained of the fabric of everyday life that people barely bat an eye, but also the inverse of that, which is that terrorist resistance to the system is utterly futile. Chalk it up to bad sportsmanship. 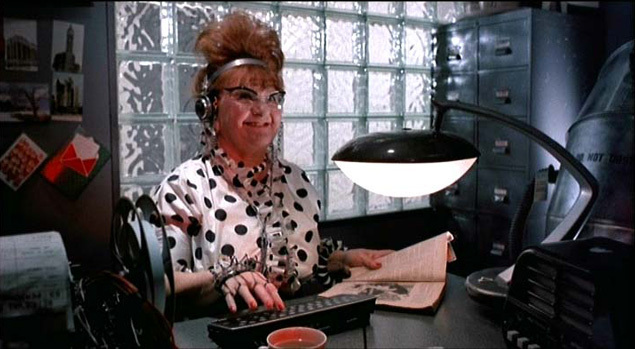 Tasha: One more gag: Jack’s matronly secretary, using her clumsy, uncomfortable version of a dictaphone to transcribe his interrogations in progress. In another past-as-dystopic-future touch, she looks every bit the role of a 1940s steno-pool girl grown into indispensable personal assistant. Look close, and you can see what this plump, cheerful-looking lady is typing out: “I’ve done nothing!… Why am I here?… What is that you are putting on my head?… Ahhhhh, oh God… No don’t… Ahh please… Stop!… I can’t stand… Aiiieeee!” And when she casually pulls her headphones away from her head, the agonized shrieks she’s dutifully interpreting into text become audible for the audience. Just one more Brazil gag about how inured everyone is to horror in this chamber of horrors. Scott: The end of this movie—the true ending, the one in the director’s cut—is one of the saddest and most devastating I can recall, simultaneously ripping us away from the happy vision of Sam’s escape and situating him in the middle of this vast, lonely, hopeless place that dwarfs his being. You could be optimistic about it and say that at least Sam can be happy within his own fantasy, but that’s a stretch. The final image is of the individual being dwarfed by the system, and its effectiveness is enhanced by the fact that Gilliam spends the rest of the movie whisking us through this byzantine bureaucracy without giving us the bigger picture. Mike: The effect of the ending to a large extent depends on which cut of the movie you see. If you pop in the Criterion DVD or Blu-ray (as I just did to make sure), you’ll see the closing credits roll over a stark shot of Sam sitting in the torture chamber. That’s the version that apparently played in Europe. But the version I watched at least 10 times in California circa early 1986 superimposed big, fluffy clouds (footage on loan from The Neverending Story) over that image, which strengthened the well-at-least-he’s-happy reading. Without the clouds, it feels significantly grimmer, and to this day, I feel a weird knot in my stomach when I watch Gilliam’s preferred version and they don’t show up. Matt: While the dream sequences provide Sam with his only escape throughout the movie, I think the argument could be made that Gilliam, particularly in the director’s cut, is telling a story about fantasies’ destructive potential. 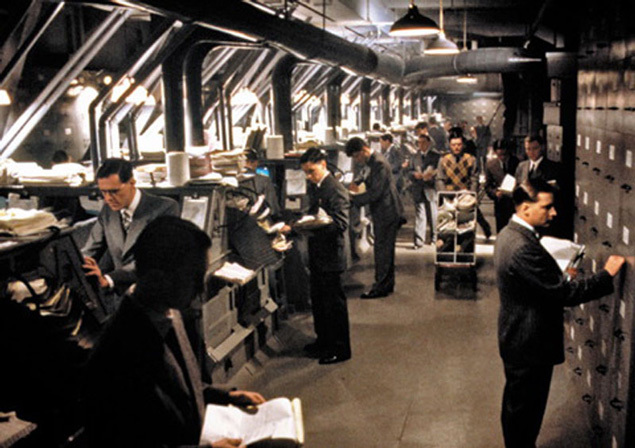 At the start of the film, Sam is relatively happy with his place in the bureaucracy. His dreams essentially cause his undoing; they’re what inspire him to accept the new job in Information Retrieval and defy the government, two decisions that come with extremely harsh consequences. In the end, a dream delivers one more happy moment, but at the cost of Sam’s sanity. It’s not exactly the most positive portrayal of the life of a dreamer. Tasha: Really? As I said Monday, I think the point is the exact opposite. In the end, fantasy is Sam’s only salvation from a horrible, helpless situation in the middle of a horrible, destructive society. I never interpreted the story to suggest that his fantasies earlier in the film were taking him out of his life of contentment as a bureaucrat—they’re part of who he is. They initially represent his dissatisfaction with his life and his dreams of something better. Then, as he fights the system, they provide a metaphorical framework where he’s fighting the same battles, but as a brave, capable hero instead of a hapless schmoe. They’re what keeps him going. And at the end, they’re his escape from an unescapable system. Brazil is cynical about practically everything, but not about dreams. The life of a dreamer gets Sam out, while everyone else is stuck in their poisonous prison. Matt: I guess so. You could read that final image of Sam alone in the torture chamber as Gilliam encouraging us to dream; Sam escapes, but we’re left behind in the hell of the everyday to conjure up some dreams of our own. But like Mike said, that final image is still so grim. It doesn’t feel like much of a victory. Our Movie Of The Week discussion began yesterday with the keynote essay on all the ways Brazil almost didn’t happen, and concludes tomorrow with Keith Phipps’ look at how the film anticipated a future political landscape.